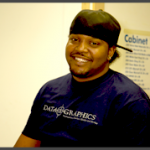 Laser Die Cut Prototypes | Data Graphics Inc. Laser Die Cut Prototypes | Data Graphics Inc. When you need a product cut out with precision, laser die-cut prototypes are the best solution. With laser die-cut prototypes, Data Graphics Inc. can create products that boost your company’s brand and corporate identity. Whether you need a corporate logo sign in your company’s reception area or a custom display component to assemble at a trade show, you will get the crisp letters and designs you expect with laser die-cut products. You can order acrylic signs, counter signs, custom letters and logos, display and sign components, screen printed graphics and laminated dimensional graphics. There are several options available for dimensional lettering and display components. A brushed, metalized polyester film laminate or brushed metal-like acrylic can give your company’s signage a metallic look. Digital graphics created by laser die-cut prototypes can give you an eye-catching look and shape that is sure to attract customers. Screen printed die cut precuts give a rich, full color in a variety of shades and hues. 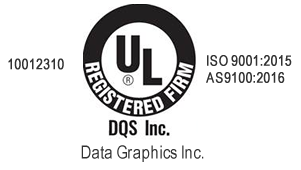 Data Graphics utilizes state-of-the-art die-cutting processes to ensure customer satisfaction. 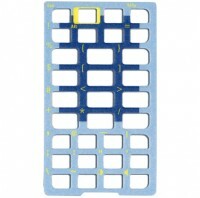 There are numerous materials that can be die cut, depending on the customer’s choice. Data Graphics can print your laser die-cut products with a variety of methods. Data Graphics’ 25,000-square-foot facility in Mount Dora contains the most modern laser die-cut and printing equipment available on the market today. You can have your die cut products screen printed, digitally printed, hot stamp printed, thermal transfer printed or flexographic printed. No matter what ideas you have for your laser die-cut prototypes, our art department at Data Graphics can bring your concepts to life. Our art staff can generate original concepts or work with your company’s design team to come up with a design that works. Bitmap Graphics (tif, jpg, gif, psd and bmp) and vector graphics ( fh, ai, cdr, pdf, eps) are accepted formats for artwork. The average turnaround on a job can take seven to ten business days after the artwork has been approved by the client.